Whether you’re into fly-fishing to bass fishing, read about tips, tactics and locations here. The Smiths have lived in Lake County for almost 50 years, enjoying the natural beauty of Clear Lake and the surrounding areas, the friendly people, and relaxed life style — most days are like being on vacation. Living in the 100+ year-old Keeling home on the estate property, next door to the Carriage House, they handle all aspects of our cottage rental and take pride in trying to think of everything that will make their guests’ stay a memorable one. To ensure there’s enough sturgeon to keep in coming years, state managers will close retention on Lake Roosevelt, where anglers have enjoyed a bang-up season, the first in more than three decades. “It was great for the local economy, and our goal is to continue to have fisheries into the future,” says WDFW’s Chris Donley. He says the state share of sturgeon on the Northeast Washington reservoir on the Upper Columbia was 10,000 going into the season slated to run May 27-Sept. 17 with a daily limit of one, two for the year. But 3,500 will have been caught by the end of this month, leaving roughly 6,500 available for an opportunity the state had hoped would stretch for nine more years. Before it opened, it wasn’t clear how well the fishery would go, as it had been more than 30 years since sturgeon were retainable here. But with improved angling techniques and equipment, as well as a no-distance-is-too-far outlook, fishermen took advantage of it. Indeed, anglers came from near and far — really far away. “I saw plates from Utah, Wyoming, Arizona — people flying in from Texas to take a trip,” says Donley. The rule-change notice has not been officially posted, but he’s proposed to close retention as of an hour after sunset July 31. He says that in the future there may be tweaks to the regs, perhaps a change to the slot limit or season to help the fishery last that much longer. “It’s been a great fishery. Really happy with the catches,” Donley says. With sturgeon declining in the Upper Columbia, state, tribal and provincial managers began releasing young fish into the system on either side of the international border in 2004. Survival rates were higher than expected, allowing state and tribal anglers to share in the bounty. Fishermen from the Colville and Spokane Tribes had yet to catch their quotas and were expected to continue fishing after July 31, according to WDFW. This year, the Colville Tribes began releasing sturgeon reared at WDFW’s Wells Hatchery into Lake Rufus Woods as part of relicensing of a Douglas County dam. In addition to his more than 30 years as a guide, Terry’s a noted seminar speaker and a favorite subject of writers focused on salmon techniques. Fisheries: Columbia and Willamette Salmon and Sturgeon. North Coast Oregon and South Coast Washington Salmon and Steelhead. Tillamook and Nehalem Salmon. Whether you are a novice or a seasoned angler, fly-fisher or spin caster, you’ll have the time of your life reeling in pacific Salmon, Northern Pike, Arctic Char, Dolly Varden and Arctic Grayling all on the Anvik River. Your guide will take you by jet boat to the hottest fishing you can imagine. We’ve got this entire gin clear river to ourselves so there’s no need to fly out to other rivers to find fish or escape the crowds. Since the Anvik River is shallow enough to wade and we have almost 24 hours of day-light you can fish right in front of the lodge, unguided, from the docks or shoreline until late in the evening if you wish. The Tucannon River, once a productive Blue Mountains foothills steelhead fishery that dropped way off, is poised for recovery. Now, if that doesn’t gel with your understanding of this northern Columbia County fishery, you would not be alone. Recent years have seen some changes with the Tuc. Washington steelheading is in a state of serious flux and perhaps no river exemplifies that better than the Tucannon. • Where once this Snake River tributary was stocked with out-of-basin summer-run smolts, the progeny of native fish from the valley now fire the hatchery program. • Where for three straight years no harvestable fish were released, they are once again. • What once was a fall fishery now is a late winter stream. • Where all those changes led to the impression that the Tuc wasn’t worth fishing anymore, there actually are fish to be caught and kept. Now, this is not to say the Tucannon’s going to be en fuego this month – it’s not, this season’s A-run is low and the smolt release for return this year was just 50,000 – but going forward, late winter is going to be when to start hitting this small river. Along this journey, the river is paralleled high up by Forest Service roads, then Tucannon Road, briefly by U.S. 12, and finally Highway 261 in its lower reach on either side of Starbuck. Note we said Starbuck, singular. This town is not named for the ubiquitous coffee chain, nor the first mate on the Pequod, but a long-forgotten railroad official. There used to be a tackle shop in Starbuck that dispensed with fine advice, but Darcy Linklater tells me they closed Darver Tackle last May. With the Lyons Ferry KOA also shuttered till March, that means you should bring all the fishing gear you need because local supplies are tight. Speaking of tight, so is access to the Tucannon, but there are a couple nice long stretches to get on the river. The lowest is at the mouth, the Army Corps of Engineers’ 390-acre Tucannon Habitat Management Unit. It encompasses about a mile of water, mostly below 261, but a bit above. Parking is near where slackwater begins, depending on height of the Lower Monumental Pool, and there’s an outhouse there as well. The second stretch to check out is at Smith Hollow Road, where a kind farmer allows access to the river. Linklater says to watch for the 2-by-2 mini fridge sitting on the fence along 261; register there to fish upstream of the bridge, on the other side of the Tucannon RV Park. Local game warden Brendan Vance says there are a few local landowners who will give permission, either verbal or written, to access the river as well. At the top of this piece, you’ll have noticed that Donley said that “most of the fish” will be entering the river this month, as conditions moderate. That advice is based on passive integrated transponder, or PIT, tag data that shows how switching from the old Lyons Ferry broodstock – which originated from Wells Hatchery in North-central Washington – several years ago to a localized broodstock also radically altered when returning adults enter the river. According to sonar arrays near the mouth, Lyons Ferry fish stormed in in late summer and by December 1, 70 percent were in the river. “That big blue hump is why the Tucannon fished so well in October, November, December,” says Donley, referring to a graph put together by WDFW research scientist Joe Bumgarner in Dayton that shows the arrival of the old stock as a blue line. But the times, they have a-changed. “If you’re fishing like you used to in October, November and December, there aren’t any fish in the system,” he notes. The same graph shows that the new in-basin stock more closely echoes the wild run, with just 20 percent of the overall return in the river by Jan. 1, 30 percent by Feb. 1, and somewhere around 45 percent by March 1. March 1, however, is when the Tucannon closes, meaning more than half of the hatchery steelhead won’t have been available for harvest this season. This has not gone unnoticed by WDFW. NOAA is, of course, the National Oceanic and Atmospheric Administration, and its National Marine Fisheries Service, NMFS, is the reason the Tucannon’s hatchery program has seen a big transition through the years. Into the 1970s, sportfishing here was dependent solely on wild steelhead, with 2,000 or more believed to have been annually harvested as late as the ’50s, according to WDFW. As you can imagine, dams, habitat and harvest all led to the run tanking, and so hatchery production began. In the late ’90s, however, steelhead throughout the Snake system were listed under the Endangered Species Act, and with that came scrutiny from NMFS about WDFW’s use of Lyons Ferry fish as hatchery broodstock. To make a long story short, while production with those steelhead continued, unclipped smolts from a wild-based broodstock began to be released in 2000 as part of a five-year test. However, after half a decade “there wasn’t enough information to determine” if that strain could replace the Lyons Ferry stock, according to WDFW. So, another five-year test was ordered, and then four years into it NMFS asked for a new hatchery genetic management plan, then said it wouldn’t authorize any more releases of Lyons Ferry fish. “Luckily, by 2010, we had enough information to determine that the ‘test’ program was successful in returning adults to support not only the sport fishery, but also to maintain a conservation component of the program to help support the depressed wild origin population,” three WDFW biologists write in a paper entitled “Where Have All The Tucannon Steelhead Gone? And What Is WDFW Doing To Fix It?” It can be found in the Tri-State Steelheader’s spring 2016 newsletter (tristatesteelheaders.com). Thus began the phase-out of one stock and phasing in of another, but there was a hiccup. Promises of additional space at Lyons Ferry hatchery didn’t come to fruition, according to WDFW, and so no fin-clipped steelhead were released into the Tucannon in 2011, 2012 or 2013. The result of all that is that harvest went from more than 1,600 in 2011 – the second highest take back through at least 1968, state stats show – to just 132 in the 2014-15 season, the fewest in 30 years. With such a miserable season, it’s no wonder why anglers have given up on the little river. “Because of no harvestable releases from 2011-2013, and that word spread that ‘no’ hatchery fish were being released anymore, the angling pressure was almost non-existent this past fall/winter – something we would like to see changed,” write the state biologists, Todd Miller, Joe Bumgarner and Jeremy Trump. Here’s where things stand now: WDFW’s goal is to raise 100,000 smolts a year for release, with half of those being fin-clipped for harvest. It’s possible the agency could in the future rear more, but that depends on a lot of moving parts. (Millions of dollars are being spent on habitat work in and along the Tucannon for spring Chinook restoration.) In the meanwhile, this month should see a push of one- and two-salt steelies into the river. The biologists acknowledge that this season might not be that great, but they’ve got their eye on the future. They’re asking anglers to return to the river, keep all hatchery fish (retention is mandatory), and tell fellow fishermen that once again harvestable steelhead are returning to the Tucannon. As for how to fish the river, it’s really no different than other steelhead streams. Where there’s deeper, slower water, like at the mouth, try a shrimp-tipped jig under a bobber. Where there’s current across a flat, swing a spoon. Find drift fishing water, run a Corky and eggs through it. Bait’s legal, though you’ll need to crimp your barbs. Trump, the biologist, says that it won’t take much to spur the steelies into biting, just an increase in air temps and flow. “As we move into late January and February the fishing should pick up, and those fish that are currently holding will begin to move upstream with increases in flow,” he says. One thing to watch will be flows out of Pataha Creek, below Highway 12, which can make things muddy as these wheatlands begin to thaw, Trump tips. Gauges for both the Tucannon and Pataha can be found at waterdata.usgs.gov/wa/nwis/rt and through ecy.wa.gov/index.html, respectively. Catfish are the Rodney Dangerfield of Stumptown’s fishing scene: they never get any respect. Salmon, steelhead, sturgeon and other species get all the glamour, all the press, all the covers, but catfish are a worthy target themselves. They grow big, they fight hard, bite easily, and their fillets are light and tasty. And while they get little respect from some, they are getting attention from an increasing number of anglers in Portland and Vancouver who have figured out how much fun Mr. Whiskers can be. In fact, there are so many good local spots that I couldn’t fit them all in one article. So, this issue we’ll look at Portland-area catfisheries, and next month, discover the plentiful opportunities on the north side of the Columbia River. Get your drawl on, grab some stinkbait and let’s look at PDX waters. Every single source for this story pointed to the Gilbert River first, and it may well be the best catfishery in the Portland area. This Sauvie Island stream flows from Sturgeon Lake to the Multnomah Channel and is home to big channel cats, a few blue cats and plenty of bullheads. But despite giving the D River a run for its money as the state’s shortest, it’s long been well known for whiskerfish, says Mark Nebeker, the manager of the state wildlife refuge on the island. Nebeker says that not all the bullheads are small, and some reach very respectable sizes. Channel cats can run as big as 18 to 20 pounds, and he once checked a blue catfish in the 30-pound range. Eric Tonsager of the Oregon Bass and Panfish Club is a bona fide catfisherman who spends most of his time on Eastern Oregon rivers, but he wets a line for cats near home once in a while. He likes to fish the Multnomah Channel and the Gilbert River, an area he confirms is no secret. He says bank access is very good along the Gilbert, and he points to the Big Eddy as being one of the best spots. “It’s a sharp, 90-degree turn in the river, and lots of big catfish are taken there,” he says. From time to time, he also uses cutbaits such as northern pikeminnow cut into 1-inch cubes. He leaves them at room temperature for a bit; just to get some smell going. “But don’t let it rot!” he warns. There is a good population of channel catfish throughout the Willamette, and they migrate out of the big river into the tributaries in the spring to spawn. When the heat arrives, the fish head back down to the Willamette to spend the summer in the deep holes, and they become very nocturnal. The bite is best from dusk to dawn. You might expect a set of waters with a name that hearkens to the country’s catfishing heartland to feature whiskerfish, and you would be correct. He reports that there is no stocking schedule, but he puts channels into the small lakes along I-5 just south of Woodburn when his budget allows. Cats to 20 pounds are sometimes caught here. The species are also planted in Wilsonville Lake, Woodburn Lake and Hartman Pond on a semi-regular basis. Henry Hagg Lake is popular for bullheads, which grow well and reach sizes of 12 to 15 inches. Of course, all warmwater habitats around Portland have bullheads, but they are predominately in the 5- to 7-inch range. One of the enduring mysteries of whiskerfish in the Northwest is the story of the 15-pound white catfish caught in the Tualatin River in 1989. Deemed the Oregon record for the species, however, it is the only verified white catfish ever taken in the entire state. How did it get there? That’s a good question, says Galovich. His research turned up records of 300 white catfish brought up from California in 1951, and placed in a defective holding pond. “When they drained the pond they only found 12 left,” says Galovich. While the rest escaped into the Willamette system, Galovich says the chances of them surviving, spawning, and continuing the line, and eventually producing the record fish is unlikely. Tucked back in the hills and featuring great access, the Clearwater’s South Fork produces good fishing for nice steelies. For a number of years my high school had a tradition of starting out the softball and baseball season with a two-day tournament in Orofino. The tournament was always scheduled for mid-March, when snow covered the fields of North Idaho and far Eastern Washington. It also coincided with the latter part of the steelhead run on the Clearwater River and its tributaries. Since I helped with the coaching duties I would always make the trip, but unfortunately I never had the opportunity to do any steelheading. Then one year I decided to take a fly rod along and try my luck between games. The schedule would give me enough time for a couple hours of fishing between contests. Someone suggested the nearby North Fork of the Clearwater, which had a lot of fish in the river at the time. So between games I made my way down to the North Fork, walked to the water’s edge and started to cast into a very clear, slow-moving section of the stream. To my delight, very quickly a nice 24- or 25-inch fish followed my fly – until he got close enough to inspect the offering and abruptly turned and swam away. As I continued to work this section the same thing happened three more times. Even though I changed flies, tried different retrieves and speeds, the results were the same: no takes. I even switched to a sink-tip line, but all that did for me was a couple hook-ups on rocks and the loss of two flies. That evening I went into a grocery store to buy some snacks and drinks for the next day. While in the store I ran into one of my former students, who was working for the U.S. Forest Service out of Orofino. I told him my tale of woe and he said I was really fishing in the wrong spot. He went on to tell me that the Clearwater’s South Fork was the preferred destination for most fly fishermen. He stated that it was a smaller river with well-defined holes and generally much easier to wade. The next morning I left just after dawn to make the relatively long drive to Kooskia and the South Fork. Although we had a game at 11, I felt there was enough time for a couple hours of fishing. Unfortunately, just after I arrived at the river the heavens opened up. After only a few casts it was very apparent these were not the ideal conditions for steelhead fishing. Nor was it ideal for softball or baseball either. The rest of the tournament was cancelled and I went home with nothing to show for my efforts. SINCE THAT ILL-FATED journey to the South Fork I have fished it several times, learning a great deal more about it and gaining much more respect for this outstanding fishery. The river forms at around 4,000 feet, just outside the old mining town of Elk City. Its upper reaches flow through a narrow, heavily timbered canyon on Forest Service land. Steep and full of rapids and pocket water, you might catch cutthroat, rainbow, brook trout, mountain whitefish and possibly bull trout here. The water in this section is cold and very clear, even though a number of mining operations have worked the area in the past. The swift current, higher elevation and shade trees help keep water temperatures cooler through the warmer summer months. Further downstream, the gradient becomes more level and the river bed widens. Water temps rise in this section with a consequent negative impact on the fish, particularly cutthroat and bull trout. There is considerably less streamside vegetation and shade in this lower section. The river flows through more private land the closer it gets to where it empties into the Middle Fork of the Clearwater River. The main attraction in this part of the river is steelhead, which start showing up en masse this month and in April. For the most part, these are B-run fish, meaning they have spent an additional year in ocean and thus are older and bigger than their A-run counterparts. “Big fish in small water is the major allure for the South Fork,” says Mike Beard of Northwest Outfitters (nwoutfitters.com). in Coeur d’Alene, these steelies often run in the 12- to 20-pound range, with the As coming in at 6 to 10 pounds. Shallower, wadeable water punctuated with deeper help make this stream a destination fishery for flyrodders from all over the Northwest. But even though it can provide excellent steelhead fishing, the South Fork can also be rather fickle, requiring knowledge of the river and fish habits. Often the steelhead remain downstream in the Middle Fork until conditions are just right. The best time to fish is after a rain or melt-off has created a push of colder water, then stabilizing at around 350 to 500 cubic feet per second. In addition, nymphing is a more effective method than the usual swing fishing approach. 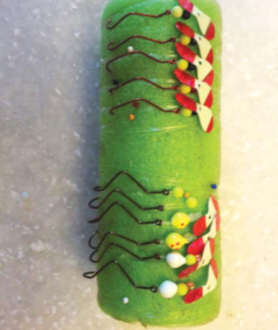 An egg pattern or beads are probably the most productive approach during March and April. One of the most popular set-ups is to tie a pinkish color bead on the line an inch or two up from the eye of the hook and another on the hook itself. Since larger hook sizes are required (size 10 or perhaps larger), heating the bead may be required to slip it past the bend of the hook. Although other egg and nymph patterns are effective, this particular set up has been effective for me. Beard uses this same bead arrangement, but ties on a Kilowatt fly with the beads as a dropper. He feels the Kilowatt can be an attractor for the beads, but sometimes the steelhead will be more active and take the lead fly. The South Fork is excellent fly water, but other methods are effective on the river too. Bait is very popular and productive, and probably the most effective technique is a jig baited with a shrimp below a bobber. While bait fishing with a treble is popular in many spots, it should be pointed out that only single-point barbless hooks are allowed when fishing for steelhead or salmon in the South Fork. This time of year it may be advisable to linger longer in a particular hole, as the fish are often rather lethargic. Considering the popularity of the South Fork in March and April, if you fortunate enough to be fishing a suitable hole and move, chances are someone will take your spot and you may not be able to find an empty hole. STATE STEELHEAD MANAGERS recently instituted a new program to help improve the number of fish returning to the South Fork for spawning. Enlisting the river’s anglers, each are given a long plastic tube of sufficient size to safely hold very sizable steelhead. Starting in February, a tanker truck cruises the highway along the river, collecting the tubes and steelhead. The fish are then transported to the national fish hatchery in Orofino, where the eggs are fertilized and the hatchlings can be reared for release. Releases back into the South Fork are staggered in order the better equalize the run. 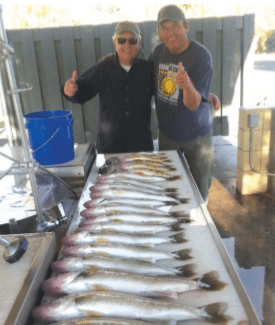 According to Joe Dupont, Idaho Fish & Game fisheries biologist for the Clearwater Region, four years of work and study have gone into the program and at this time it seems to be working fairly well. Last year, all 225 needed pairs had been collected by March 7. It is probably too soon to tell what affect this will have on the overall number of steelhead in the drainage, but indications are encouraging. Another program that has many anglers excited involves Chinook. In 1927, the former Lewiston Dam was constructed, effectively ending the migration of king salmon into the Clearwater River and its tributaries. The dam was removed in the 1970s, but the recovery of the fish has been exceeding slow. To help out, IDFG has expanded its stocking program and are planting during the summer as well as the spring and fall. The number of Chinook has been increasing throughout the drainage, including the South Fork. If this trend continues it would be a great addition to the fishery. Although the South Fork is best known for steelhead fishing, and justifiably so, the river provides excellent fishing for a number of species. It might be considered a river for all seasons. To reach the South Fork, simply follow the Clearwater River out of Lewiston and turn onto Highway 13 south out of Kooskia. The highway follows the river all the way to Hapston Grade. There, stay to the left on Highway 14, which goes all the way to Elk City. Daily limit is three fin-clipped steelhead, and the season runs through April 30. The water temp is 58 degrees and the winds are light. Nearby on this Tuesday are 25 other boats on the water – five times the amount of traffic I’d see if I was fishing the mouth of the Methow River in Pateros for steelhead. Don’t get me wrong – my first love is fall and winter steelheading, but walleye fishing may just take half my recreational time this winter, as long as the weather holds out! Why? The fishing is excellent and super easy to understand – the only problem we have is that the rookies try to set the hook on almost every bite. This isn’t trout or salmon fishing, where you set the hook and hold on. The idea is to feed a walleye when one grabs your bait. I learned this technique while fishing with a Professional Walleye Trail pro in 1999 and 2000. Give the walleye line for about three seconds so that the fish can start to turn the bait in their mouth. Then I sweep the hook with one steady motion until the weight of the fish is solid, and reel slowly up. We have something more productive than an octopus glo hook to offer the walleye. The Slow Death hook is the biggest improvement in walleye fishing in the last 10 years. This hook allows you to troll all the way through winter, and it uses the worm to create a rotating action while trolling .7 mph and up. Winter trolling needs to be kept at under 1 mph and this is the rig to do it. I enhance my rig with a Shaker Wing that I developed for MoneyMaker Products. I was the first person to use a Mack’s Lure Smile Blade and packaged and named this award-winning product while I worked as the marketing director for Mack’s from 1996 to 2002. I have been using the blades for the past 19 years until lately. If you know anything about me and the development world, then you can count on improvements to be made that challenge the status quo. I designed the patent-pending MoneyMaker Shaker Wing over 16 months ago to spin faster and shake more at slower speeds. The lopsided design is proving to be extremely effective while fishing side by side against other blade patterns and designs. The Shaker Wing is helping me look better than I am, and that is one reason why I am going to take up walleye guiding and maybe fish a few more tournaments in the near future. THE GREAT THING about Potholes Reservoir is that the state park ramp is right next to the most popular fishing hole on the lake for walleye. The launch has two lanes and a nice dock in the middle. With the lake full of walleye, bullheads, perch, bluegill, crappie, bass and rainbow trout, you will likely catch three or four kinds of fish while you are going after the walleye. It is a ton of fun to troll along the 30- to 40-foot shelf straight out from the launch. You can also try to find the secret humps on Fish-n-Map’s Potholes map, available at local tackle dealers, a good buy if you don’t have a depth finder with the chip for Potholes on it already. The info on the map will help you mark spots that are productive. Fat perch the size of your shoe are a bonus catch at the reservoir, and there’s a daily limit of 25 with no minimum size. The combined bluegill and crappie limit is 25, and the latter species must be at least 9 inches. Daily limit on walleye is eight, with only one over 22 inches allowed. In season, the state park boasts a world-class cleaning station with electricity and a fish grinder, but it closed as of Nov. 2. MarDon Resort (mardonresort.com) also has a boat ramp, as well as a tackle store; for the latest fishing info, be sure to check with the Mesebergs (509-346-2651). I can see why Potholes Reservoir has a boatload of midweek traffic during the fall and winter until it ices up, and I will see you there in December, trolling very slowly. I might even take up blade baiting as the water cools off further. I will not be alone if the weather is nice. Enjoy your fishing journeys as we discover productive and new products and techniques to try together. The next article will be on dressing up your favorite casting spinner to catch more trout and steelhead year-round. Guide, conservationist, fisheries advocate – there are many pieces to the subject of this month’s feature in our continuing series on all-around Northwest anglers. So exclaims Bob Rees, the executive director of the Association of Northwest Steelheaders, Northwest Oregon and Columbia River guide, and fish and fisheries advocate. IT’S THE LAUGHTER coming from Bob Rees’s boat that usually gets your attention. Rees has a way of trolling right up behind you without attracting much attention – that is, until the laughter breaks out. You glance back and see Rees standing at the tiller making minor adjustments to the motor, while leaning in and telling his clients something that sets them off laughing again. As you think to yourself that it’s good his clients are having so much fun but they must not be taking the fishing too seriously, someone hooks one almost on cue to a punchline of a joke just out of earshot and the entire boat erupts in uncontrollable laughter again. Fish around Rees enough and you begin to see the pattern: This guy is having a good time, and it’s infectious to his clients. At first encounter with Rees, you wonder if it’s just a show that he puts on to be a good businessman; no one could be that easygoing, quick-witted and fun all the time, could they? Well, I hate to break it to you, but yes, Rees is the real deal. He truly loves what he’s doing and is glad to share his good fortune with pretty much everyone. GROWING UP, REES was lucky that a friend of his father’s was a good fisherman and willing to share his knowledge. With the flame kindled, Lake fanned Rees’s fishing passion by taking him down to Diamond Lake fishing many times. Rees believes that it’s extremely important to pass on your knowledge and passion for fishing to the next generation, whether you have children or not. “If parents don’t support that passion, that energy is going to go somewhere else, and not necessarily good,” he says. When we talked in late February, Rees had just wrapped up a new two-day event put on by the Steelheaders. Called Family Fish Camp, it was held near Rockaway Beach for families wanting to find out more about the sport, or if they’re already anglers, how to refine their skills. By building the next generation of anglers, Rees believes you also recruit the advocates who are going to fight for the future of our fish. REES’S INTEREST IN fish increased in high school, when he contemplated running a guide business from shore. But he really got serious when he entered college and got his fisheries degree. Shortly after graduating he got a job as an Oregon Department of Fish and Wildlife fish checker in Astoria. His career so far has provided some very rewarding moments. But even more important than standout days is the graduation of fishermen Rees has seen over the years. Still, there’s work to do, and Rees is willing to do it. As much as he enjoys battling for the resource for all of us, fighting fish is just as important to Rees.